Crews from Elford Construction put the finishing touches on the DACC’s consolidated campus Friday before work is suspended on the project due to lack of funds. DACC Superintendent Mary Beth Freeman said the board will resume construction after they have a letter certifying a new levy. The Delaware Area Career Center will begin taking steps to put a four-county levy on the ballot in November after House Bill 124 was signed by Gov. John Kasich on Wednesday. House Bill 124 was authored by state representatives Andrew Brenner, R-Powell, and Rick Carfagna, R-Genoa Township, and extends the DACC’s renewal levy that was passed by Delaware County voters in 2015. The levy passed by 10,644 votes in Delaware County and was supposed to appear on the ballot for 1,026 voters in Franklin, Marion, Morrow, and Union counties. However, due to an error made by the Delaware County Board of Elections, the levy did not appear in Franklin, Marion, Morrow, and Union counties and when it came time to collect taxes from the levy the Ohio Department of Taxation refused to certify the levy because the 1,026 residents in the other counties did not get a chance to vote. With the approval of House Bill 124, the DACC board has the option to place the levy on the ballot this November in the other four counties. Delaware County residents won’t have to vote on it again. However, in response to the loss of funds, the Delaware Area Career Center Board of Education voted this June to suspend construction on the DACC consolidation project and place a levy on the ballot in all five counties this November to replace the 2015 levy. 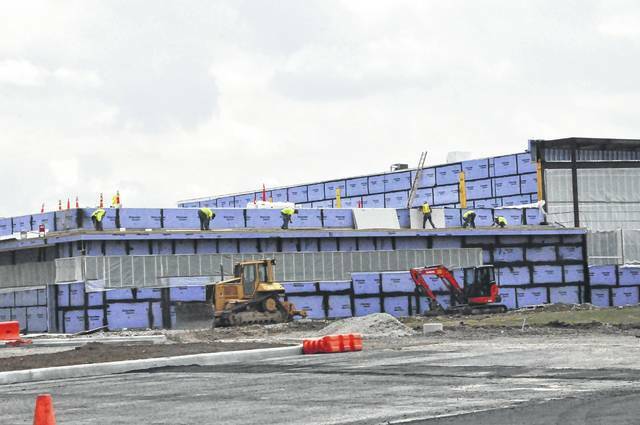 At its June meeting, the DACC board said they waited to temporarily suspend construction at the consolidated campus until the new section of the building was structurally sound so it would not deteriorate over the break. Friday was the last day of construction before the temprorary suspension began. House Bill 124 was approved by the House on May 17 and was sent to the Senate Ways and Means Committee. An amended version of the bill approved on June 21 by the Senate and the bill was signed by Kasich on June 28. The legislation also stipulates that it would continue the previous renewal levy, which would contain rollbacks from the State of Ohio, instead of a replacement levy, which would not contain the state rollbacks. Freeman also praised Brenner and Carfagna as well as State Sen. Kris Jordan, R-Ostrander, for working to get the bill passed as soon as possible. However, the bill’s passage does not mean the construction project will resume. Freeman added that the board now plans to place a replacement levy on the ballot in Franklin, Marion, Morrow, and Union counties this November. Alicia Mowry, Public Relations Supervisor for the DACC, said Friday that the DACC plans to remove the five-county levy before the election, but is keeping both levies on for the time being so that in the event of something going wrong, the DACC won’t miss the August filling deadline. https://www.delgazette.com/wp-content/uploads/sites/40/2017/07/web1_DACC-crop.jpgCrews from Elford Construction put the finishing touches on the DACC’s consolidated campus Friday before work is suspended on the project due to lack of funds. DACC Superintendent Mary Beth Freeman said the board will resume construction after they have a letter certifying a new levy.